Korea (but not opposed to optional approach), EC (Not sure how options would work, rights are more appropriate), Japan (More rights is better), Colombia (would like a wider scope). Canada: … but maintains position of allowing opt-out or reservation on retransmission as usual. Australia: …nothing on policy issue but precise re wording regarding "public" (not “general”) or persons with disabilities instead of disabled etc. Switzerland does not like the preamble and is confused by meaning of protection and promotion of cultural diversity and the apparent “mistrust” some might have toward broadcasters and cablecasters. All submissions to WIPO are at here. Art 12 L &E: Delete 12 (3), the “list”. Art 14 Formalities: Delete, US has “formalities”. Art 2 (2) Object of Protection: Not consistent with Brazil’s legislation that treat cablecasting and broadcasting differently. Art 4 Relation to Other Treaties: Delete (2) and (3). Limit application so no encroachment on the public domain nor on copyrights incorporated. Art 7 National Treatment: Support K (the Berne Model). J not acceptable. Art 8 Protection: exclusive right in 8(1) not consistent with GA decision. Delete. “by any means” also not in agreement and would be detrimental to consensus. Art 10 Encryption: Not consistent with signal-based approach. Abusive when no “unauthorized activity”. Art 12 L & E: Replace may by shall to promote secure and predictable. Delete 12(2) the importation of the 3 step test designed for copyrights not signal.. Add to 12 (3) library and archives. Art 13 Term: Delete. No term for signal. Art 17 Enforcement: Delete, should be left to national jurisdictions. CHINA Support for narrow and specific protection against signal theft. Art 8 Protection: Question on 8(i). Does “by any means” include over computer networks? Also does “deferred retransmission” cover “communication to the public” and “transmission following fixation” “making available to the public”? Art 5 Definitions: Delete “by satellite” this clause will open to broader interpretation. Same for (d) “cablecast”. Art 8 Protection: clauses are extension or broadening of the scope of the agreed objectives. Art 13 Term: as we adopt signal based it is not relevant. Art 14 Formalities: imitating copyright principle not a basis for signal based. Art 16 Application in Time: “again, there is no point in returning to right-based approach”. INDIA: Preamble: Treaty is for the “protection” of broadcasting organizations. Art 2 Object of Protection: protection is limited to the extent of rights acquired or owned by the broadcasting organizations. Art 3 Scope: It is not clear whether this clause will also cover transmission simultaneous or deferred of broadcast over computer network. Art 4 Relation to other treaties: again protection shall be afforded to the extent necessary to enjoy rights acquired or owned by the broadcasting organizations without impinging on the rights of the original rights holders. Art 5 Definitions. Make definition consistent with signal-based approach mandated by GA. Also exclude “over computer network”. No need for “physical support” since communication to the public is not a prohibited activity. Art 6 Beneficiaries: both conditions need to be satisfied to be treated as a national of anther contracting party. Art 10 Encryption. Same effects as TPMs. Potential to prevent dual use of technology. Remove clause. Art 13 Term. Needed only if fixation and reproduction is agreed to be protected. Alternatives in Art on National treatment may neutralize the optional view of the chair on rights. Scope: since SCCR 14 decision to limit to broadcasting and cablecasting in traditional sense. Webcasting and simulcasting to be dealt in a separate process. All references to computer network, or “by any means” should be removed. Object of protection: see protection against signal piracy. Exclude prebroadcasting signal since they are not assembled or scheduled. Art 16 Application in Time: how would that work for countries not providing exclusive rights (as in 8(2)? Art 17 Provisions on Enforcement of Rights: Again, how would that work if no exclusive rights as in 8(2)? Art 3 Scope: Is internet protocol considered like webcasting and thus excluded? Art 8(1) Protection: Insert 3 more rights (making available original and copies, to members of the public and communication against fee). Delete 8(2) which is the alternative to rights! KOREA General: Suggest WPPT model. Support rights but do not oppose optional approach. Art 13 Term: Support 50 years for balance with related right holders. The plenary started right before lunch break. (I know, sounds funny) The Chair provided us with his "draft conclusions". He instructed the delegations to talk about his conclusions during lunch and to come back at 3pm with reactions. However, Columbia, Brazil, India, the EU wanted the floor. Brazil and India made excellent interventions. Brazil stated that now they wanted to be on the record (since yesterday nothing is on record!) that they want a blanket reservation on their position on non-papers and informal sessions. They had additional comments on the draft conclusions: there should not be reference to a revised 15/2 since there was no agreement on what was revised. They asked that the conclusions reflect that by replacing "revised 15/2" by "revised non-papers". Also somewhat inappropriate is the list of matters in paragraph 2 of the chair's draft conclusions. Since the previous meetings were informal and not on the record...there is no record of where each issue (objectives, relation to other treaties, definitions, beneficiaries, rights, L&E, term and TPM/DRM) stand and thus no way to see a trend. Finally, the last papragraph amended by the chair at the beginning of session looked like a re-writting of the carefully crafted mandate that came out of the GA. I found also very interesting Brazil's request that there be a "process", a "member driven process" by which member states could provide input (non-papers?). So far, only the chair is contributing with non-papers and I heard yesterday a "non-slide" about the objective of the treaty. The chair did not want "too many to speak" but had to let India make its statement. Asking for clarification, India describe how the list of matters did not reflect agreement and was just a list of matters that have been discussed for years. According to the mandate, only matters where agreement was reached should be listed. The plenary ended on that note. People here are puzzled. If you only point to agreement (on or off the record it seems), the non-conclusions might end up very very short. Would that mean that this meeting did not really happen? Like a non-meeting? However, some people seem to be happy and are sure that the tanker (that is one of the image used to describe the treaty here!) cannot be sunk. Today, right after the NGOs were allowed take the floor for 2 minutes each, the secretariat distributed the "new treaty". It's called "Chair's non-paper Combination of the four non-papers on Articles". Check out the rights, the limitations and exceptions and the term... and let me know if you think this is really about signal? Or maybe signal is not what I think? 1) The provisions of this Treaty shall apply to the protection of broadcasting organizations in respect of their broadcasts. 2) The provisions of this Treaty do not give rise to any rights in the programme content that is transmitted by the broadcasting organizations. (2) Protection granted under this Treaty shall leave intact and shall in no way affect the protection of copyright or related rights in program material incorporated in broadcasts. Consequently, no provision of this Treaty may be interpreted as prejudicing such protection. (3) This Treaty shall not have any connection with, nor shall it prejudice any rights and obligations under, any other treaties. [Manon: NEW] 4) If this Treaty does not provide rights or protection for the same scope and on the same level as the Rome Convention or the TRIPS Agreement, Contracting Parties, who are Contracting States of the Rome Convention or members of the TRIPS Agreement, will apply the provision of these treaties between themselves. 1) The provisions of this Treaty shall apply mutatis mutandis to the protection of cablecasting organizations in respect of their cablecasts. reception may be individually chosen by members of the public. [Manon: new] 3) The provisions of this treaty shall not provide any protection for netcasting organizations in respect of their netcasts transmitted over the computer networks. (2) Each Contracting Party may choose to apply the obligation provided for in paragraph (1) only to the extent that the other Contracting party applies [Articles ] of this Treaty. If a Contracting Party avails itself of the possibility provided for in this paragragh, the Contracting Party shall notify this application to the Director General of WIPO. ii) the fixation of their broadcasts. iv) the communiation to the public of their broadcsts, if such communication is made in places accessible to the public against payment of an entrance fee, or using very large screens in places accessible to the public, or made in a profit making purpose. (1) Contracting Parties may, in their national legislation, provide for the same kinds of limitations or exceptions with regard to the protection of broadcasting organizations as they provide for, in their national legislation, in connection with the protection of copyright in literary and artistic works, and the protection of related rights. (2) Contracting Parties shall confine any limitations of or exceptions to rights provided for in this Treaty to certain special cases which do not conflict with a normal exploitation of the broadcast and do not unreasonably prejudice the legitimate interests of the broadcasting organization. (3) Subject to the provisions in paragraphe 2, and in accordance with paragraph 1, Contracting Parties may provide for limitations and exceptions to the exclusive rights provided in this Treaty for such purposes as private use, educational uses, scientific research, uses for the benefit of disabled persons, legal deposit requirements, reporting of current events, and use for public security and judicial purposes. [in italics] [The notion of "limitation" / "exceptio" is relevant in the context of exclusive rights or corresponding protection (possibliy including right to prohibit). The term of protection to be granted to broadcasting organizations under this Treaty shall last, at least, until the end of a period of 20 years computed from the end of the year in which the broadcasting took place. iii) removal or alteration of any electronic inforamtion relevant for the protection of the broadcasting organizations. 4 articles of rights to "reformulate" 20 pages of July draft. it is supposed to reflect signal based approach. iv) the communication to the public of their broadcasts, if such communication is made in places accessible to the public against payment of an entrance fee, or using very large screens in places accessible to the public, or made in a profit making purpose. 2) The provisions of this treaty do not give rise to any rights in the programme content transmitted by the broadcasting organizations. January 17, 2007. SCCR Special Session 1. "to agree and finalize on a signal-based approach, he objectives, specific scopes and object of protection.."
"the goal is to make the treaty more acceptable for all. Delegations are invited to consider the next preparatory steps based on these elements"
Approach: 'on a signal-based approach"
[...]"focus should be set on the protection of the "live-signal"
"if the range of exclusive rights and that of protections would be reduced, and also the object made more precise, the Delegations could consider to reduce or narrow down also other provisions, surrounding these provisions on protection"
[...] its fcus is on "anti-piracy" function but it provides also protection agaisnt competitors and against unfair exploitation and against free-riding"
"If the provisions on rights would be reformulated or reduced, the delegations could also consider qualifying some of the provisions on protection to be applicable only against acts that are committed fr commercial purposes, for competitive uses, or for outright misappropriation ("theft of signals")"
The treaty would provide a form of protection, consistng of related rights, and/or other specific protections that are not defined as rights. They are independent and self standning rights or protections in relation to rights of authors and other right holders of the programme content. They do not interfere with, nor do they depend on, other rights." The Delegations could consider what elements are absolutely necessary to meet the objective of the treaty, and the need for an adequate and effective protection." Task 3 "object of protection"
The object of protection is the "broadcast"
The term "broadcast" has not been defined in any international instrument. If now defined, the term should ideally have the same scope as in these treaties [Rome Convention and TRIPS], and in any case should not be narrower. It is suggested that a technologically neutral definition of the "broadcast" be added to the instrument, and possibly complemented by a definition of the "signal". How to make an omelette without breaking an egg or a new approach to WIPO casters treaty? Mike Keplinger: At the General Assembly, clearly it was decided that without consensus there would be no diplomatic conference. The goal is to re direct to signal protection. This is not an easy task. We have ground rules. We have art. 20 [he meant art. 22] of Rome. So, there has to be some components of Rome. It does not say it needs to go beyond Rome. But it opens ways. It's unfortunate that webcast has been taken out. We'll work on that probably in the near future. So now we have to have a narrow treaty with consideration for Rome and for signal protection. You can read all my notes --sorry, I'm no typist -it's a bad summary most of the time -- but maybe it can help understand where we are 2 weeks before the next WIPO committee meeting SCCR S1 Jan 17-19, 2007? List of participants is at the end (if you were there and I did not catch your name and affiliation, let me know). summary of my notes. The participants (a list is at the end) were more eloquent (or insulting or funny) than my notes can express. 1pm-3pm USPTO Alexandria Virginia. Over 40 (?) people in the room and many on the phone. No recording allowed but free to take notes. Introduction of new members of the US delegation: Paul Salmon (PTO) and David Carson (Copyright Office). Also present everyone knows Marla Poor (Copyright office) [ manon: and Lois Boland, PTO but not at the table). [Reads summary/quote of decision in Sept 06 at the WIPO general Assembly]. It was decided to have two more Standing committees on Copyright and related Rights, one in January and one in June to work on oustanding isues. The GA also stated need to have a signal based approach. Today's meeting is to hear your views, what are provisions that you found problematic and what would you support. 2 minutes to make your first statement and then we'll go around again. art. 15 we want exclusive rights and not just rights to prohibit but maybe we could have hybrid rights. Re the Limitations and exceptions, we're opposed to have mandatory L&E because that would be against our national interest. The treaty should not create a precedent, it will be used against the national interest. You see last report to the government re importance for private party to protect against piracy. We endorse Ben Ivens's comments. And for us, re 2 to 4 there are other reasons why there not appropriate in an IP treaty. They would create a precedent of and odd clause. For retransmission "by any means" we believe that language should stay in. It must include the internet. Example of Icrave tv. And TPM is a key provision. The current draft is not equivalent of WPPT. Re definitions and pre broadcastcast: it currently causes problem with affiliates and suppliers. One another point is the meaning of signal approach. it is not clear (giggles). Clearly we would not support that. we're opposed to exclusive rights approach. That was elimnated in Geneva. We would for 9 to 16 focus on theft. There's no need for a new treaty. TRIPS is enough. Many companies do not think it is needed, for others like in the Caribbean case, it can be dealt with signal theft. This treaty should not go into people's living room. More exclusive rights would not help and are not needed. I do not want to repeat what Jim Burger said but add that this is not a copyright treaty but a related right treaty. Adding a new intellectual property right will add a new layer wih a new ownership. It will block flow of information even when the copyright owners agree. Would be problematic for fair use and public domain works. The US law has an anti signal theft approach and has shown that it is an effective approach. Also mandatory limitations and exceptionsare part of US national interest. We have fair use , we have first sale. And these new rights would not account for that. Regarding the example of icrave tv, and other pirate station, they are brought down very quickly. So it is an effective regime. James Love: Part of problem of the treaty, when it was firt proposed, it was like a Rome+ model. The idea was to take old treaty and put the internet and tpm etc in it, you get more extensive rights than in Rome. That was it until a few years ago. With where technology is going, and a lot of criticism regarding the new paradigm, the US tried to find exit strategy. And the conversation gravitated to signal protection. The rhetoric was all about piracy. and what are the piracy problems, but there's no text on the table. The complicated text of the chir, the text on the table is full of poison pills. Then, the US had a victory at the GA and managed to pull out of the fire. But what is the follow up of that? How do you get to signal protection. Some country has to put a proposal on the table. It has to be a streamlined. As in the development agenda, there are strong support for L&E but people could back off, if you get rid of exclusive rights. If not cultural diversity will be there at the diplomatic conference. My question: is the us prepared to work and table as a discussion draft a signal protection paradigm? if not, you're not serious. It has to be tabled by a government and by the US Gov. It has the support of several countries. But it requires leadership. Representing the interest of telecom indust. from big to small. They all have in common that they offer internet services and program or able distribution. We have yet to hear anything from them about the need for this teaty. However, based on WIPO's decision to move with signal theft approach, we believe it is the best approach. Obvioulsy there are many issues, scope, and others, but we believe signal protection from any alledged harm is best. At the previous roundtable, we all agreed, piracy is bad and there is a need to address that but in narrow way and without granting of exclusive rights. We're also concern about TPMs, it would be a hurdle for consumers to use works in their home and we are also concerns re intermediary issues. We stand prepared to work with US delegation. We support the treaty for broadcasters, cablecasters and netcasters. We support the US proposed text. The treaty should focus more on signal and less on exclusive rights but we recognize that most developed world already provide exclusive rights and there's been no harm, it's overblown. One thing that is essential: to protect against retransmission over the internet. Otherwise the treaty is meaningless. But first do no harm to existing treaty. mentions of access to knowlegde and diversity could have adverse effet on existing treaties and should be excised from the text before going to diplomatic conference. We're concerned about TPM. It should be just like the WPPT, thats' where we are. It makes sense to have a signal approach but the definition is important. Whatever the approach, it is important to focus on limitations and exceptions. All L& E should be carried forward if we're talking about copyright-like infringemnt (and not about signal). I'd like to expand on the "do no harm"to copyright owners and others. What about new devices and services. Now all is moving signals, to your phone or other devices etc. There are serious concerns to attached new licenses etc. And yes, the European countries haveRomebut they also have a lot of regulations, re anti trust etc. We have a different system. Finally, the liability issue is important: for retrasnmitting signal, we would need to go to each country to get a carve out in each country if it is not in the treaty. In light of the GA decision, the current draft is not focus on signal protection. Right now it is not consistent. Also I would like to make 2 points: on the scope of rights. The new layer especially without mandatory L and E would endangered consumers, also the broad scope would stiffle innovation. My second point is in re of tpms: if we are talking about signal, it is already in US law. If it is a post transmission control then it is in consumer's living room, and like the broadcast flag it will be with a technical mandate. Finally, and I have been involved for some times, I have not heard about need for a new intellectual property right but only for signal protection. We need a more targeted treaty and implementation. representing Internet coalition, our membership is concerned about liability issue. and interested mostly about what is the US strategy to protect against creation of liability. For internet service providers, their scope of responsibilities in this treaty is a concern. We need limitations on liability. I am concerned about definition. In internet environment, every thing can be seen as internet transmission, and it is in digital form by definition. Many device (handheld even) will be receiving signal, so will it be view as a computer environment? If it is excluded, the basis of the treaty would not be useful. If we must have any treaty, it should be narrow and apply to signal. The industry is on the record: if it i not clearly signal, we're opposed. There are issue of liability, if new rights, it will be expensive. Also, there's need for consumers to have access to content protected and use of different devices, and the current treaty construct is antithecal. Our interest is narrow. But as boradcasters, we have thelargest audience within the US. We spend a lot of time and money all over the world to gather news from the air from casters etc. We are members NAB, NABA and EBU and we're oposed to this unless fair use is in. This this treaty must leave room for fair use rights. From our limited perspective as broadcasters, we think it is a Human rights issue to have access, you have to protect our narrow rights. I would add that the treaty is inconsistent with US law. We're not member of Rome. So, we would go from 0 year term to 50 years! Re L & E, it is chocking to hear the opposition. Re the TPMS. I have the scars, we do not have tpms. I was glad to hear Fritx it should be like in the US. Finally, people who do not support more exclusive rights do not have to prove why, the US has the most robust broadcasting industry.It is if you proposing new regulations that the burden is on you. Lee Knife: the impetus of the treaty was to move to the future so it should include the internet but a lot of resistance to webcating or netcasting comes from the fact that the treaty it s too braod. So we would like a narrow theft approach that would include netcasting. For small webcasters, what we do is precarious. And liability is a concern. If this is not copyright infringement it should be about signal theft. Thinking of the little guy transmitting public domain workss. And as a citizen, I am opposed to anything that infringes on fair use. For us, it's like a database rights. We have been studying the treaty and the balance and robustness of coyright and L and E. Necessary for the system. We share concerns re intermediary liability and want to add to definitional issues. The mandate from the GA is different. it is different from exclusive rights. And we do not solve anyhting if we just rename it. We support a signal based approach. I also want to briefly respond. I hear the mantra: if it is not copyright infringement it should be signal. But if this is the case it is irrelevant. It has to have value added. Copyright infringement is not the end of this exercise. James Love: Important question: who are the beneficiaries? Rome did not cover cable. Now with satellite and cable, there are new beneficiaries. Is it for the people like comcast who come to your house with cable? Or is it like New corps showing FX that would be the beneficiaries? It seems that the cablecasters are the big beneficiaries and we never heard of them in any meeting!? This new layer is anti consumer and anti innovation. The cost of broadcasting is falling every day and with so much new technology, it not a good time tor regulate with a 1996 approach. We should have a minimalist approach. To follow on Neil, if you get a bona fide copy by paying for cable and you get the colbert report it is permitted use, but not if you hack into cable then that should be addressed by the treaty. There is a difference between permitted use and hacking. Can the US delegation clarify who are the new beneficiaries? Are we talking about both comcast and FX (or TBS)? Both would be beneficiaries according to newscorp because both are cablecasters. We can see the creation of thickets of rights. Well, cable is not part of Rome and it is illegal in the US. Here we have time warner and vivendi and copyright owners will lose from aggregators. I'm surprised why the recording industry would support people who package their works. Conflicts. There's a little misunderstanding. This treaty should deal with signal. When content is fixed, the treaty should stop there. And our members do not own network. Our agenda is not that different from yours. We agree about distinction between content and signal. As a consequnce, we're first to say abandon economic rights and go for signal protection approach. And we also want to address public interest concerns. We could create a perfect world where broadcaster would have protection of their signal only. The performers (including) aftra all along supported signal protection and do not support more rights. We support the RIAA. I would like to thank NPR for statement. And then my next point is Europe. There's a shift now. Broadcasters have problems in Europe now. It should be irrelevant. Our own broadcasters are strong. But it's interesting that the EU which has so much problems (see the huge report) is a model. On content portection. All broadcasting content gets protection. But news and sports, do not get protection in other countries. The broadcaster do not oppose L and E that already exist. But it needs to be consistent with other treaties. As with content. What is the advantage of having different l&E. Manon Ress: just a clarification on the new and sport are not protected. Where are they not protected? I checked with experts such a Bernt Hugenholz and he said that they are protected under copyright everywhere. Maybe Erika can tell me in what country it is not protected? or the US delegation. Ben Ivens: Are you going to let them...can we we have some .....she sitting next to him, she should consult with Tom Rivers. Regarding what Sarah said. Imagination runs wild, truly. She also says, signal are everywhere which is why we need protection. In US law we have communication law. It's bad that Gigi left. It is an economic right and it has no limitations and exceptions. it's part of us law since 92. What she said is flat out not true. And TRIPS is not adequate. icrave is not the only example there are manyother examples....I can provide a list...there are many many examples. Now the notion that terrible things will occur. Back in 98, in a WIPO report, we have 50 coutnrie with exclusive rights and nothing terrible happened in those countries. And if the notion is contrary to US laws then there will be changes, it is not against US laws, it is is different...and again Gigi re 0 term to 50, we said we can negotiate. And to Neil (NPR): be careful to get what you ask for. Think of china, ways they treat journalist, they will ask for their own L&E if we want fair use. I would like to ask a question. Exclusion of webcasting why? Ann C: we would need 2 hours. But no, we stood alone out there. The lone country in favor of inclusion of webcasting. so we agreed to compromise. I am struggling with the concept of broadcast. And there's been idea of importing fair use. But what about if it is encrypted? Leaving that aside, what does it mean to be a broadcaster. A broadcaster could also help other services, like medical record, or you do not want fair use of a bank account? Re "if not copyright infringment, it should be a signal theft" we do not need a mandatory list of exeptions. Right now in 17, instead of "may" should be "shall". There should be parity and mandatory is better than optional. Erika: I need clarification. "shall" as same in the country re content? My imagination did not run wild. There are competitions and difficulties getting access in some markets. It would be foolish to think that no one will use these new rights we create, they ll want to use them. Neil T.: If we suggest "shall" same as for copyright would they be relevant? We should hold off until we know the scope? Doug (Intel: We've been fighting tooth and nail in strident opposition to buidl home network. Listening to the comments, the consensus is signal. And we'd opposed anything going beyond that. Sherwin: when you [talking to ben ivens] say propriety right for broadcasters exist, but it is a very limited exclusive rights. It is not exercisable againt copyright owners or users. It is an exageration to say on par with other ipr. Bradley: Maybe we have consensus on signal and then it is the beginning only. Where does it start and end. Whether you call it a signal or right. re L and E. the more rights, the more L&E, they are join at the hip. The more you exclude exclusive rights, less need for L&E...if it is only signal there can be zero L&E. For example, there's no fair use of cable service. If you push for more economic rights, you will have more L and E. if you do not want to see L and E you stopat signal. Mike Keplinger: At the General Assembly, clearly it was decided that without consensus there would be no diplomtic conference. The goal is to re direct to signal protection. This is not an easy task. We have ground rules. We have art 20 of Rome. So there has to be some components of Rome. It does not say it needs to go beyond Rome. But it opens way. It's unfortunate that webcast has been taken out. We'll work on that probably in near future. So now we have to have a narrow treaty with consideration for Rome and signal protection. Kevin Goldberg Fletcher, Heald &Hildreth, P.L.C. WIPO Casting treaty: Where are we and where are we going? The GA approved 1) the convening of the Diplomatic Conference on the Protection of the Rights of Broadcasting Organizations under the conditions set out in paragraph 4 below from November 19 to December 7, 2007, in Geneva. The objective of this Conference is to negotiate and conclude a WIPO treaty on the protection of broadcasting organizations, including cablecasting organizations. The scope of the treaty will be confined to the protection of broadcasting and cablecasting organizations in the traditional sense. 2) The Revised Draft Basic Proposal (Document SCCR/15/2) will constitute the Basic Proposal with the understanding that all Member States may make proposals at the Diplomatic Conference. A first meeting of the 3) preparatory committee will be convened for June 2007 to prepare the necessary modalities of the Diplomatic Conference. The preparatory committee will consider the draft rules of procedure to be presented for adoption to the Diplomatic Conference, the lists of States, as well as intergovernmental and non-governmental organizations to be invited to participate in the conference, as well as other necessary organizational matters. and 4) two special sessions of the Standing Committee on Copyright and Related Rights to clarify the outstanding issues will be convened, the first one in January 2007, and the second one in June 2007 in conjunction with the meeting of the preparatory committee. These two special sessions of the SCCR should aim to agree and finalize, on a signal-based approach, the objectives, specific scope and object of protection with a view to submitting to the Diplomatic Conference a revised basic proposal, which will amend the agreed relevant parts of the Revised Draft Basic Proposal referred to in Paragraph 2. The Diplomatic Conference will be convened if such agreement is achieved. If no such agreement is achieved, all further discussions will be based on Document SCCR/15/2. Finally, 5) the WIPO Secretariat will organize, in cooperation with the Member States concerned, and at the request of Member States, consultations and information meetings on the matters of the Diplomatic Conference. The meetings will be hosted by the inviting Member States. If approved, there will be Diplomatic Conference on the Protection of the Rights of Broadcasting Organizations, from November 19 to December 7, 2007. As the first special session is soon, ie January 17-19, 2007, the question of whether the final text will really be a signal-based approach is not that settled. We heard that during informal consultations in Geneva, some delegations were pushing again for including exclusive rights. A coalition of public interest groups sent a request for a public meeting with the US Delegation before the January special session hoping among other things to clarify the approach that will be discussed. Nobody is really paying much attention to the truly new beneficiary of the proposal, the cablecasters, and the effect of the additional cost of creating yet another layer of required permission for cablecast program on the public, small broadcasters, librarians etc. Who are the new beneficiaries of the proposed WIPO broadcasting treaty? The truly new players at WIPO are the cablecasting organizations. Until now they were no where in international treaties or agreements of any kind. Who are they? Can someone clarify? Are the new beneficiaries of protection, the cablecasting organizations, like Comcast or rather more like MTV and HBO? Or both? WIPO explanantion: The definition of “broadcasting” in item(a) contains the classical definition of broadcasting. It attaches itself to the tradition of copyright and related rights treaties in which the notion of “broadcasting” is confined exclusively to transmissions by wireless means, by radio waves propagating freely in space, i.e., radio waves or Herzian waves. Consequently, no transmissions by wire are included in “broadcasting”. Because this definition would be based on the traditional notion of broadcasting, no possibility of uncertainty or interference could emerge in the interpretations of existing treaties. The definition follows the definition found in Article2 of the WPPT. The first sentence of the definition is built on the prototype definition of broadcasting found in Article 3(f) of the Rome Convention. Article 11 bis of the Berne Convention operates with the same concept of broadcasting. For the sake of completeness, the expression “of sounds or of images and sounds” has been replaced by “of sounds or of images or of images and sounds”. It is proposed that “transmissions over computer networks” be excluded from “broadcasting” in order to make clear that computer network transmissions, even when transmitted by wireless means, are not intended to qualify as broadcasting. Certain Delegations proposed a broader definition of “broadcasting” that would comprise not only wireless transmissions but also transmissions by wire, “including by cable or satellite”. A narrower definition of “broadcasting” has been proposed in the Draft Basic Proposal for consistency with existing treaties in the field of copyright and related rights. Transmissions by wire, including by cable, are defined as “cablecasting” in the Draft Basic Proposal. The end result concerning the scope of application of the Treaty (by providing separate definitions for “broadcasting” and “cablecasting”) is exactly the same as by using the broader definition of “broadcasting”. WIPO: Item(b) defines the term “cablecasting”. The definition follows mutatis mutandis the definition of “broadcasting” in item(a), and also in the WPPT. The notion of “cablecasting” is confined to transmissions by wire. No wireless transmissions, including by satellite, are included in “cablecasting”. In the definition, the interpretative clause referring to encrypted signals is maintained. For the same reason as in the case of the definition of “broadcasting”, “transmissions over computer networks” are excluded from the notion of “cablecasting”. The definition of “cablecasting” is needed if the notion of traditional broadcasting is adopted in the Treaty as proposed, but would be superfluous if the Treaty were based on a broader notion. WIPO: The definition proposed in item(c) consists of three main elements: (1) the person shall be a “legal entity”, (2) taking “the initiative” and having “the responsibility”, for “the transmission”, and (3) for “the assembly and scheduling of the content of the transmission”. In the Treaty there is no definition of the term “broadcast” and no definition of "cablecast". WIPO: Item(d) contains a definition of “retransmission”. The notion of “retransmission”, in the defined form, embraces all forms of retransmission by any means, i.e. by wire or wireless means, including combined means. It covers rebroadcasting, retransmission by wire or cable, and retransmission over computer networks. Retransmission is relevant only when it is done by another person than the original transmitting organization, and done for the reception by the public. This is manifested in explicit terms in the proposed definition. It follows the definition of “rebroadcasting” of the Rome Convention which is confined only to simultaneous broadcasting of the broadcast of another broadcasting organization. The Berne Convention also operates in a similar manner; Article11bis(1)(ii) sets forth the rights of authors in respect of their broadcast works, using the concept of simultaneous retransmission (using the expression “communication to the public by wire or by rebroadcasting”). WIPO: Item(e) contains, for purposes of the Treaty, a very specific, narrow definition of “communication to the public.” It refers to the special case of public performance to an audience present in the place where the performance (“rendition,” “display,” etc.) takes place. It draws upon the concept used for television broadcasts in Article13(d) of the Rome Convention but extends to the communication to the public of program content of transmissions, or retransmissions, conveying both sounds and images and sounds. Communication of this type may include the reception of a signal and projection of the program content of the broadcast to the public in a café, hotel lobby, the premises of a fair, on the screen of a cinema, or in other premises open to the public. The definition is meant to include making program content audible and/or visible to the public through a radio or a television set located in the types of premises mentioned above. In one proposal “communication to the public” was limited to television as in the Rome Convention. In other proposals “communication to the public” was extended to “communication” or “rendition” to the public from a fixation of a transmission. 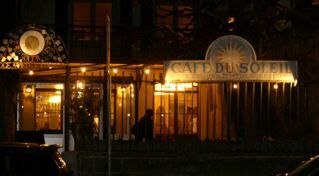 Some Delegations limited the right to control the “communication to the public” to places accessible to the public only upon the payment of an entrance fee. The extent of the right in this respect shall be decided in the context of Article 10. Finally, it should be noted that the expression “(any) communication to the public” has been used for different purposes in the Rome Convention and the WPPT, and in the Berne Convention and the WCT, as compared to this new Instrument and each other. WIPO: Item (f) defines the term “fixation”. It follows the definition of “fixation” in the WPPT. After the phrase “embodiment of sounds”, the phrase “or of images or of images and sounds” has been added. The term “embodiment” covers the result of incorporating or recording program material carried by a signal using whatever means and whatever medium. Furthermore, it should be pointed out that, as in the corresponding definition in the WPPT, the definition of fixation does not qualify or quantify the duration of the life of the embodiment necessary to result in fixation. There are no conditions regarding the requisite permanence or stability of the embodiment. transmissions by the beneficiaries of the protection of this Treaty, and not to works and other protected subject matter carried by such signals. (2) The provisions of this Treaty shall apply to the protection of broadcasting organizations in respect of their broadcasts. cablecasting organizations in respect of their cablecasts. mutatis mutandis (the necessary changes having been made) application, to cablecasting organizations. Find the full notes of Day 3 (September 13, 2006) of the WIPO SCCR 15 meeting on the Broadcasting Treaty taken by EFF and CP Tech and the final recommendations. Here is the rather straightforward WIPO press release. A key committee of the World Intellectual Property Organization (WIPO) agreed today to convene a diplomatic conference from July 11 to August 1, 2007 to update the rights of broadcasting organizations. This recommendation is to be endorsed by the WIPO General Assembly when it meets later this month. The objective of this diplomatic conference, the last phase of treaty negotiations, is to conclude a treaty on the protection of broadcasting organizations, including cablecasting organizations. 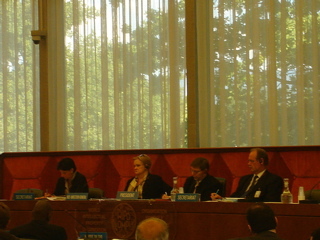 A resolution adopted by the WIPO General Assembly in October 2005 scheduled two additional meetings of the Standing Committee on Copyright and Related Rights (SCCR) "to agree and finalize a Basic Proposal for a treaty on the protection of the rights of broadcasting organizations in order to enable the 2006 WIPO General Assembly to recommend the convening of a Diplomatic Conference in December 2006 or at an appropriate date in 2007." The SCCR agreed that a draft basic proposal presented at this week’s meeting would constitute the basis for negotiations at the diplomatic conference with the understanding that member states may submit proposals at that conference. WIPO Director General, Dr. Kamil Idris, welcomed the positive outcome of the meeting as well as the political will demonstrated by member states to conclude the negotiations. He said "The positive spirit that has characterized these discussions will further strengthen consensus on these issues in the months leading up to the diplomatic conference." Dr. Idris said "The success of this process hinges on the continued inclusiveness of the debate which seeks to reach an agreement that is balanced and serves the common interests of all stakeholders." The Committee also agreed, following endorsement of their recommendation by the WIPO General Assembly, to convene a one day preparatory committee in January 2007 to prepare the necessary modalities of the diplomatic conference. The preparatory committee considers the draft rules of procedure to be presented for adoption to the diplomatic conference, the lists of states, as well as intergovernmental and non-governmental organizations to be invited to participate in the conference as well as other organizational matters. A special two-day meeting will be held in conjunction with the preparatory meeting to further clarify outstanding issues. Delegates also agreed that WIPO would organize, at the request of member states, consultations and information meetings on matters relating to the diplomatic conference. Such meetings would be hosted by the inviting member state. Discussions at this week’s session (15th session) of the SCCR were confined to the protection of traditional broadcasting organizations and cablecasting. This followed a decision by the 14th session of the SCCR from 1 to 5 May, 2006, to examine questions of webcasting and simulcasting on a separate track following the forthcoming session of the WIPO Assemblies meetings from 25 September to 3 October, 2006. Updating the IP rights of broadcasters, currently provided by the 1961 Rome Convention on the Protection of Performers, Producers of Phonograms and Broadcasting Organizations, began at WIPO in 1997. A growing signal piracy problem in many parts of the world, including piracy of digitized pre-broadcast signals, has made this need more acute. We are now at 4pm on the last of a three day meeting. Jukka Liedes is insisting upon a three page document, "Draft conclusions of the SCCR," which was handed out before lunch. It calls for a May/July diplomatic conference in Geneva. He wants a preparatory committee to meet in December 2006, with uncertain duties, and the authority to prepare a new "basic proposal" by February 28, 2007, followed by regional consolations. The treaty is supposed to "provide protection fro the signals of the broadcasting and cablecasting organizations without affecting or addressing the rights on content carried by the signal." But paradoxically, it calls for a minimum 20 year term of protection, and a set of exclusive rights, including fixation, retransmission and post-fixation "downstream" rights, as well as WCT type TPM language. Verbally, Jukkas has not given up on getting webcasting in the treaty, and many see it already in the current draft, in the various parts of Articles 5 and 9. There will be new definitions, a new preamble, and a reordering of sections. Lots of countries don't like his proposal. India is taking a hard line. But Jukka and the WIPO Secretariat staff is bound and determined to pound on delegates to go along. It is not at all obvious how this meeting will end today. After the solo performance of the chair of the committee yesterday with his promise of hugs and kisses and life long friendships at a Diplomatic conference this morning we heard the reaction from some delegates notably India and Brazil. It was not good for the Chair. They made it clear that there are still serious concerns and questioned the advisability of going for a Diplomatic conference (DC) (the final stage of Treaty making and the outcome pushed by the Chair) at this stage. The last two days have been dominated by speculations about the series of bilateral discussions that have been taking place between the US, India, Brazil and the EU. While they have all had discussions with other countries, these parties are seen by many as the keys to whether an agreement for a Diplomatic Conference will be reached. India introduced some reality into the situation and a strong rebuff to the idea that any differences could simply be resolved at a the DC. In an eloquent and detailed speech they pointed out that they still had major concerns that went to the heart of the treaty namely the inclusion of the references to webcasting ‘in its widest sense’ in the text and going beyond a signals based approach . Any further push for a Diplomatic Conference (DC) with first addressing this issue would likely lead to more acrimony than acceptance. They ended in the starkest terms, that if these 2 issues were not addressed and bought under some common understanding the ‘going up the garden path’ to a DC would likely end in fiasco..
Russia , Mexico and the Philipines then spoke ion favour of going for a DC. Brazil in a carefully worded intervention gave an insight into what has been discussed in private. Said that they would support to a certain extent a treaty which focused on a more narrower basis focusing on a right of transmission which was supported by ‘some delegates’. The reference to transmission by any means included over computer networks ( seen as the webcasting references) at least as a defensive measure was imperative to some members. The extent to which even this references would turn the Treaty into one which covered webcasting/simulcasting was the ‘million dollar question’ that required further discussion/research. Then their main concern- which was on procedure. They were not prepared to agree to a DC based on the Chairs suggestion of delegates providing him with broad drafting instructions to prepare the text to be discussed at the DC. They would want to see the text. Iran and Indonesia joined in criticism of the procedure . Iran wanted space before and DC to have a clean text . Indonesia wanted an impact study before a DC. The was then a break when the talk was that there would be no DC and that India ‘s views were key. During that break the chair's draft of next steps was circulated which includes the controversial drafting steps and seeks to set a date for the DC. The proposal for the afternoon is to go through this document point by point. Though the EU reserved the right to make a global, statement as they don’t think a point by point approach is the best way, as the issues are linked. Then lunch. The chair met with India . The outcome is not known. This afternoon session promises to be lively! So far this week SCCR Chair Jukka Liedes has strongly opposed giving NGOs the opportunity to speak. CPTech asked Jule Sigal from the US Library of Congress and Ann Chaitovitz to approach the chair to support the right of the public to speak. * The Library of Congress is opposed to having the public speak at this meeting. WIPO is not providing enough seats in the room, and unlike other meetings, there are no overflow rooms so some NGOs have not been allowed to follow the debate. One NGO was told to stop taking pictures of the proceedings. Normally, NGOs can speak, and often their contributions address important substantive and strategic issues overlooked or not adequately explored during the interventions by governments, partly because governments are often constrained by diplomatic and political considerations. There is certainly plenty of time. The meetings have started late, and often adjourned early, and many countries are saying very little during the debates. One interpretation of decision to stop the public from speaking is to control the perception that there is a consensus in favor of a new intellectual property right for broadcasting and cablecasting entities, in a model that will likely be extended to the Internet in different ways. Given the poor track record of government negotiators in protecting the public interest in several recent negotiations on intellectual property rights, ** it is certainly rational to ask if government voices are sufficient in these debates. *The USPTO and the LOC recently held a consultation on the treaty in Washington, DC that was limited to 40 participants, and did not permit the meeting to be recorded for broadcasting on the Internet. **The TRIPS Agreement, the 1996 WCT and WPPT, the highly problematic Appendix the Berne, the highly problematic 2005 amendments to the TRIPS regarding exports of medicines manufactured under a compulsory license, the plethora of recent regional and bilateral IPR chapters in FTA and other trade agreements, and the most recent UPOV plant varieties treaty. Summary of notes Day 2 "Moving toward a dip conf"
The morning session that was scheduled last night started at 10 and did not last long because the chair asked delegations to meet informally to resolve differences. The room was packed and for the first time WIPO did not provide extra chairs and there was no "room B" where one could at least listen to the proceedings. The committee ended its discussion on rights and limitations and exceptions (and TPM). Korea, Singapore and other called for a diplomatic conference, South Africa made an excellent intervention asking questions about the broad scope and lack of clarity. Like Iran, the delegation stated that the proposed text be cleaned of ambiguous terms. South Africa supports the non exhaustive list of limitations and exceptions and want TPM provision deleted. During lunchtime, the civil Society Coalition hosted a briefing in room B. Representatives from a coalition that signed a joint statement and representatives of organizations that signed onto a proposal for a signal protection only proposal expressed their concerns regarding the treaty. Consumer Project on Technology, Respondent: Mr. Sisule Musungu, Acting Coordinator, Innovation, Access to Knowledge and Intellectual Property Programme (IAIPP) South Centre. Main points were there's no justification for the treaty, no evidence was given by demandeurs, the current rights-based approach of the treaty must be abandoned, intermediary liability is not resolved, and impact on innovation. Sisule Musungu, noted that while people say that the treaty has been under discussion for "9 long years", the committee has in fact only met (at most) for 66 days...and that may not be enough "substantial discussions" for a treaty of such importance and that will last for maybe a century! And the following afternoon session was a case in point. There were very few substantial interventions. Switzerland supports the scheduling of a diplomatic conference and wants limitations and exceptions as suggested by the US corresponding to the WPPT. The Dominican Republic supports flexible limitations and exceptions as proposed by Chile, brazil and Perou. They are not really opposed to TPM but warned that they should not be detrimental to the public interest. At 5pm, the committee had a break and will meet again. The plan is (maybe) to hear the African group position on rights and limitations and exceptions and then to start the "assessment". Nigeria on behalf of the African group expressed caution regarding access to knowledge and information and TPM. They support a study on the impact of such provisions. Morocco, Kenya, Benin and Egypt spoke briefly to support the convening of a diplomatic conference in 2007. They all emtnioned the long years of discussions. Break at 6pm, we;ll be back at 7:45 to discuss how the process will move forward. The US and the EU are showing some flexibility. The Africa group has called for a diplomatic conference. Many delegates seem inclined to move ahead to get this issue behind them. Too early to tell what type of rights will be included. The TPM measures are likely to only be those relating to the protection of the signal, and not to the content. Webcasting, netcasting and simulcasting is supposed to be out, but that is not really certain, and no one really knows what Article 9 does. For the US, Canada and many other countries -- the short term outcome will effectively be a new treaty for cablecasting -- something not covered by the Rome Convention. No one has really thought about what this will mean, because the cable companies have not been showing up, and everyone was focusing on broadcasting and webcasting. But most people in the US and many other countries get TV primarily through cable, rather than over-the-air broadcasting. Who are the beneficiaries of a "cablecasting" right? According to many delegates here, it will be the cable "channels," not the local cable company. Thus, it turns out that News Corp and Time Warner -- two companies attending this meeting, will be defined as "cablecasters" for their various cable channel offerings. So too for many other big aggregators of content for cable platforms around the world. How will this play out when the cable company provides Internet access? I think this is not well thought out either. At the 15th Session of the WIPO Standing Committe on Copyright and Related Rights (SCCR), the delegation of South Africa made perspicacious remarks on the scope of definition, simulcasting, limitations and exceptions and technological protection measures (TPMs). South Africa concurred with the intervention of Indian delegate who articulated that the Committee clearly define the nature of the term "broadcast". South Africa highlighted the intervention of the Islamic Republic of Iran which called for a cleansing of the terms "by any means" and "over computer networks" from the draft basic proposal. With respect to limitations and exceptions, South Africa expressed support of Brazil's call for the "desirability of delineating exceptions and limitations". South Africa noted that the list of limitations and exceptions include a personal use exception and reminded the Committee of the need to preserve freedom of speech and enlightened values. On the question of technological protection measures, South Africa called for a careful approach that did not curtail Member States' ability to regulate anti-competitive practices. Finally, South Africa called upon WIPO to conduct a study of best practices on the enforcement of TPMs.